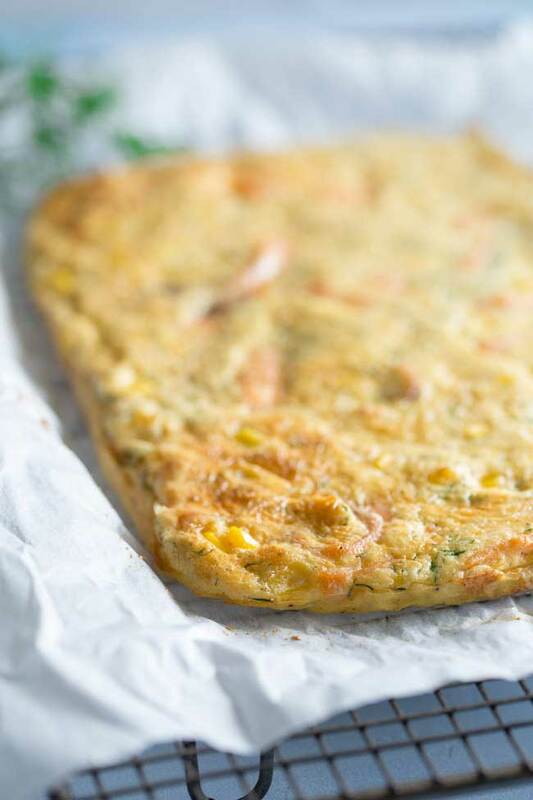 This Sheet Pan Smoked Salmon Frittata is baked in a sheet pan, making it perfect for feeding a group. Enjoy it at any time of day. Personally I like it for brunch with a glass of bucks fizz. This months Fish Foodie Friday theme is “ONE Pan Dinners. Sheet pans, Dutch ovens, skillets, or casserole dishes. Make a meal with fish that can be prepared in just one pan, and perfect for the busy cook”. Which is a great theme if you dislike clearing up as much as I do!!!! Check out the end of my post for a link up to the other bloggers who have contributed to this months Fish Foodie Friday. One pan cooking is right on trend!!! And with good reason, great food with less washing up….sign me up!!!!! I am a bit of a messy cook!!! I wish I wasn’t and I do try but my kitchen is a happy and chaotic place! For this months challenge I had thought about sharing my Tray Baked Mexican Fish, but I want to save that until a little closer to May and Cinco De Mayo, so I turned to one of my favourite prepare ahead and feed a crowd dishes, perfect for breakfast/brunch/dinfast – Which is my word for having breakfast for dinner. Come on you know it should be a real word!!! And everyone does it!! Have you ever made egg and chips for dinner??? Or served up french toast??? I know I have! And how about a Monte Cristo??? I have a casserole version of that, which is perfect for dinfast! Anyway I am way off track! 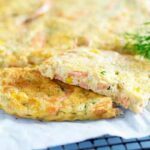 This smoked salmon frittata is so easy to make, you mix everything together, pour it into a sheet pan and bake it in the oven. Simple!!! Serve with some toast for breakfast or a side salad for dinner. And even better if you want you can mix everything up the night before and just pour it into the sheet pan in the morning!!! Prepare ahead breakfast!!! Sounds like a plan! The quantities below will serve 4 people easily and could be stretched to 6 with a side dish. Allowed to cool slightly and cut into squares this is also a great appetizer, similar to my Potato, Basil and Chive Frittata Squares which I like to serve as a canapés. If you love this recipe for Sheet Pan Smoked Salmon Frittata why not pin it for later. 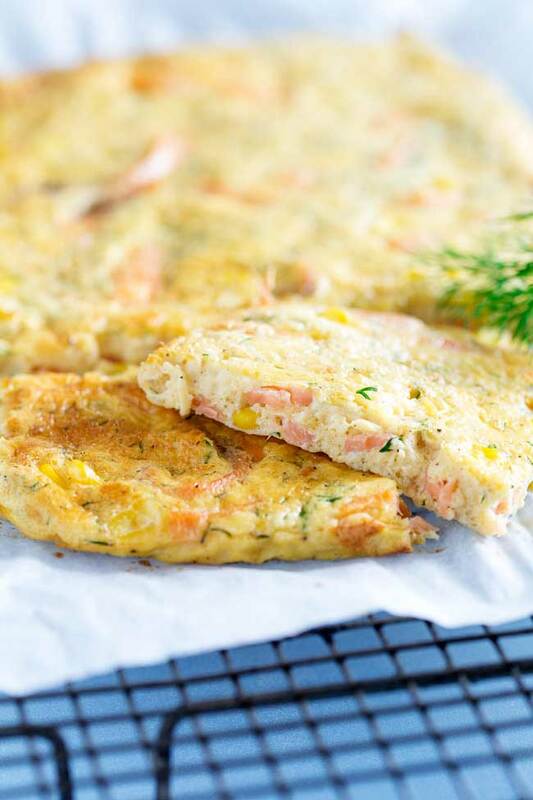 This Smoked Salmon Frittata is baked in a sheet pan, making it perfect for feeding a group. Enjoy it at any time of day. Personally I like it for brunch with a glass of bucks fizz. Crack the eggs into a large jug. Add in the half and half, the salt and pepper and the horseradish sauce. Cut the smoked salmon in to thin strips and add it to the egg. Add in the sweetcorn, dill and parmesan. Stir well and pour onto the prepared sheet pan. Cook for 18-20 minutes until set and golden brown. What size sheet pan do you have? My sheet pan is 18 by 13 in (46 by 33 cm). As you can see in the pictures this gives quite a thin frittata. So a smaller pan would work too. We love Frittata and have it every couple of weeks. I have never thought about using salmon before. I will have to try your recipes soon. I love that frittata is such an easy meal that feeds the whole family, and we are lucky enough to get fresh farm eggs from a neighbour so there is nothing better. 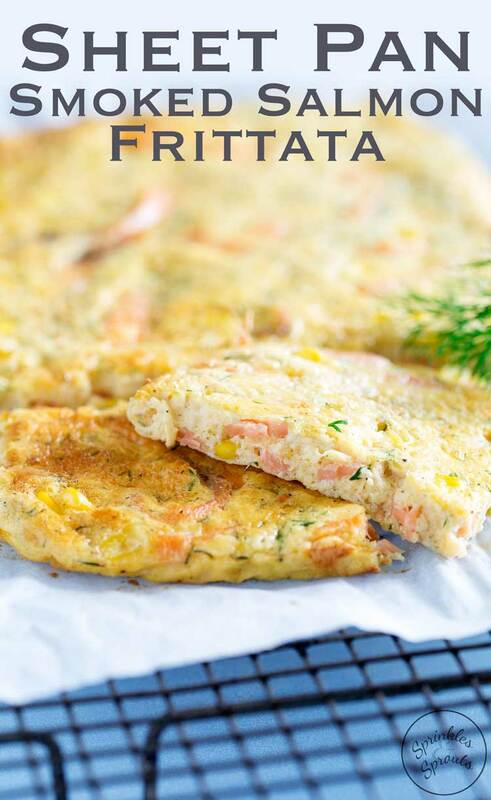 This looks perfect… never tried a frittata with fish. If you are a fan of the smoky flavour of smoked salmon then I highly recommend it. 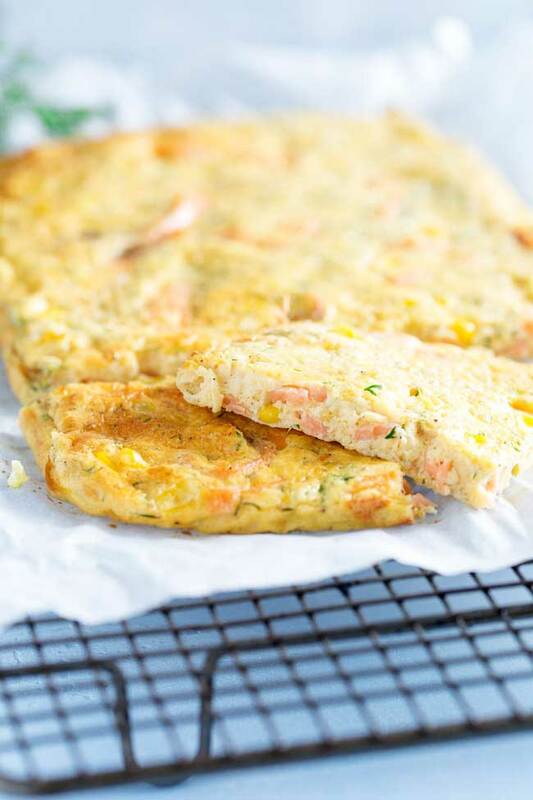 It permeates the whole frittata and makes a little bit of salmon go a long way. I never even considered a frittata as being a one pan meal. Hand to the forehead! This looks lovely! Hehe, I know what you mean, it isn’t where your mind goes to when some says one pan meal. How clever to make a fritatta in a sheet pan! I love the addition of smoked salmon. P.S. I usually make a big mess in my kitchen when I cook too. Hi Claire. I love the addition of horseradish and dill in this. Breakfast for dinner is especially good in the cooler months. Brunch is the best isn’t it!!! We call it brinner and yes this would be perfect! Brinner is such a better name!!!! Love it! I’ve made the off frittata in a baking dish but never sheet pan nor a fish version – looks and sounds great!